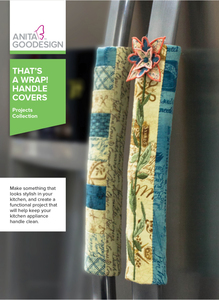 I had never heard of refrigerator handle covers until one of our artists, Sari, came in with the idea. He explained they were popular where he grew up and he wondered why we had yet to design any. They are created using Velcro and are created mostly in your hoop for easy sewing. We include a few plain versions, as well as versions that include 3D flowers for a unique look. You can match the designs to any kitchen décor and they make beautiful gifts.